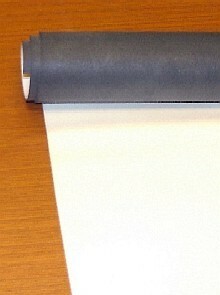 PRODUCT: WHITE EPDM Rubber Roofing / Waterproofing Membrane, 60 mil, 10' Wide, FOLDED, Class-A Fire and Energy Star Rated. Price per Foot of Length. Cuts: Cut as one piece from 10' wide product, not per sq.ft. ; up to 10x100'. Example: 8 = one 8x10' piece. Custom-cut items are non-returnable or cancelable. Sizes over 30 feet in length are heavy and must deliver by truck. Note: EPDM roofing can have factory lap-seams. These are a normal part of the manufacturing process and are factory vulcanized / fused. All pieces may have these seams. Used for new single-ply roof construction, re-roofing, repair applications, RV Roofs, Mobile Homes, Warehouses, etc. UL Fire Rated, with Flame Retardant. INSTALLATION: EPDM membrane is used in in conjunction with an EPDM grrade adhesive to create fully-adhered roofing system. To make seams or small area repairs, lap-seams are made and sealed with Seam Seal Tape. Over the seam area, a secondary EPDM faced self-adhesive Cover Tape is commonly used. See seam instructions for details. WHITE EPDM Rubber Roofing Membrane, 60 mil, 10x100 ft.
WHITE EPDM Rubber Roofing Membrane, 60 mil, 10x50 ft.
WHITE Seam Tape / Doublestick. Double-sided WHITE Butyl Rubber Based Seam Tape. Weatherbond Brand. 35 mil Thick, 3-inch Wide X 100 ft. Roll. Price/Roll.